Ian's Shoelace Site – Ian Knot Technical Info. This page contains some technical information on the Ian Knot, including its knotting origins, its advantages and its limitations. The finished Ian Knot is identical to both the Standard Shoelace Knot and the Two Loop Shoelace Knot. In fact, all three of these form exactly the same finished knot, which appears in The Ashley Book of Knots as #1212 and #1214, "The Bowknot", where it is described as "... the universal means of fastening shoe-strings together." The Ian Knot therefore isn't technically a new "knot", rather it is a new "technique" or "method", which differs only in the manner and speed of tying. The finished knot is just as secure and just as easy to untie. To those familiar with knot theory, it also isn't a new knot from a topological perspective. (I'd never even heard of "knot theory" when I first named it the Ian Knot). The core of my technique is almost identical to that used in the "Tom Fool's Knot", which is a similarly "instant" knot that is instead tied in the middle of a length of rope, using the whole hands instead of just the fingertips. The Ian Knot could be described as a more intricate variant of the Tom Fool's Knot. 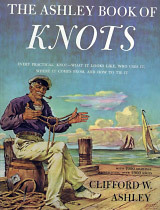 While the Tom Fool's Knot's is described in various knotting books, the definitive reference The Ashley Book of Knots even has a picture on the front cover of an old sailor tying a Tom Fool's Knot! (as seen at right). Note that the Ashley Book of Knots has some inconsistencies. The "Tom Fool's Knot" is shown as both #1141 and in more detail as #2534, the final illustration of which is actually that of the "Handcuff Knot", which in turn is shown as #412, #1134 and #1140, and which uses the same core technique as my Crossed Ian Shoelace Knot. Naming It The "Ian Knot"
As a 20 year old, there was undoubtedly some ego involved in naming this technique after myself. But the primary motivation was not ego but rather that "Ian" is a short, simple, easy to spell and thus easy to remember name (unlike my surname "Fieggen"). Since publishing my instructions on-line, I've received the occasional e-mail from other people with similar techniques – although many of them had confused the Ian Knot with the very similar looking Two Loop Shoelace Knot. I'm humble enough to accept that I am perhaps only one of many to have independently come up with similar methods. However, I have yet to discover any prior name for this technique. Books about knots have been around for centuries. Many such books include shoelace knots – yet I have never seen this technique in any book. Perhaps I'm simply the first person to have named my invention, documented the procedure and actively and freely shared it with the world? I challenge anyone to show me any publication of this technique in any book or elsewhere prior to my own first illustrations in Jun-1982 and subsequent distribution efforts. Until I'm shown a prior name, I maintain my right to have named it the Ian Knot. How Does It Compare To Regular Shoelace Knots? The Ian Knot was quicker to tie, taking only a split second compared with a couple of seconds for the conventional knot. The Ian Knot was easier to tie than the conventional knot regardless of the prevailing conditions (ie. hot or cold, light or dark, wet or dry). Every knot has its own peculiarities that have to be overcome in order to learn how to tie it tightly. With the Ian Knot, the simultaneous inward movement from both sides makes it harder to maintain outward tension on the Starting Knot. Also, neither hand has a finger free to hold things in place, as is usually done with other knots. The fingers stay closer to the starting knot, meaning that it is not released for as long. The fingers can in fact be so close to the starting knot that they actually hold it in place to some extent. The loops swing in a conical arc, maintaining tension the whole time. The finishing knot requires less tightening down once the loops are pulled through, again reducing the length of time during which any drop in tension could loosen the starting knot. Keeping the loops small and tight helps maintain tension in just the right way to keep the Ian Knot tight from start to finish. While practicing the Ian Knot, one useful measure is to tie a Double Starting Knot, which helps keep everything tight while working on the Ian Knot. It's sort of like using "Training Wheels" until the Ian Knot has been mastered, after which the regular Starting Knot can once again be used. The Ian Knot is faster than either of the traditional ways of tying shoelaces. Period! Exactly how much faster depends on how good you were at tying your previous knot and how good you get at tying the Ian Knot. I've been practising my Ian Knot for several decades. In addition, I'm using a reversed Ian Knot with the ends pulled through to tie my Starting Knot more quickly. This combination takes me about 2 to 3 seconds – depending on the particular shoelaces. I've also been practising the regular Starting Knot followed by either the Standard Shoelace Knot or the Two Loop Shoelace Knot. Either of these combinations take me about 3 to 5 seconds – again depending on the particular shoelaces. I'm therefore saving 1 or 2 seconds per knot – depending on the shoelace. At the absolute minimum, the Ian Knot is at least 1 second faster. Assuming only one pair of shoes tied at the start of the day – saving 1 second per shoe – that's a total saving of 2 seconds per day. Assuming at least one change per day between work shoes & casual shoes, school shoes & gym shoes, outdoor shoes & indoor shoes, day shoes & night shoes, or for any other reason – and possibly changing back again – that doubles or triples the saving to 4 to 6 seconds per day. Assuming that there would be some days without lace-up shoes (eg. thongs, slippers, barefoot) and other days with multiple shoe changes (as above), it's fair to assume an average of 365 pairs tied per year – that's a total saving of 730 seconds = 12 minutes per year. Assuming that one learns to tie shoes at the age of five, and assuming that one lives to the ripe old age of 85 – that's a total saving of 58,400 seconds = 16 hours per lifetime. Of course, those 58,400 individual seconds can never be combined into one continuous usable chunk of 16 hours. But considering that most people think of shoe tying as a chore, it's pretty cool to spend that much less time doing that particular chore over the course of their lifetime. Besides – to me – the Ian Knot has transformed the chore of shoelace tying into something fun. I still get a kick out of tying it! Full instructions for the Ian Knot. Identical knot using a different technique (much slower). Identical knot using another different technique (also slower). Enhanced, more secure variation of this knot (much trickier). This page last updated: 15-Oct-2018. Copyright © 2003-2018 by Ian W. Fieggen. All rights reserved.